Daniel Magariel is an author from Kansas City. His work has appeared in Granta, Lit Hub, Salt Hill, Stop Smiling, and Issue Magazine, among others. 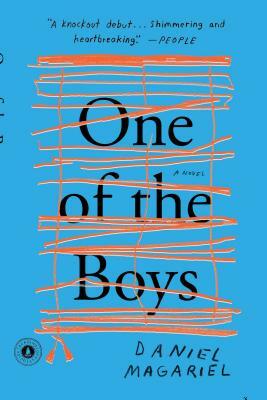 One of the Boys, his first novel, was a New York Times Book Review Editors' Choice and Amazon Best Book of 2017, and was published in twelve countries. He has a BA from Columbia University, as well as an MFA from Syracuse University, where he was a Cornelia Carhart Fellow. He currently lives in New York with his wife. Visit him at DanielMagariel.com. "A slim, deeply affecting and brutal story, One of the Boys is about the fierce power of a father-son relationship... what Magariel achieves is a novel that makes readers feel what it would be like to live on high alert all the time; to be at the mercy of a father's addictions, crackpot whims and surges of violence. He also makes us feel what it would be like to still love such a father. The subject of One of the Boys is archetypal, but Magariel's novel depicts it with the power of stark revelation. We cannot turn away." "Striking... A novel of short, blunt, often powerful sentences... Musical and painterly." "One of the most striking debut novels of the year... one of the most affecting portrayals of the bonds that keep us tied to family... It's [his] compassion and deep understanding of the dynamics of addiction that make Daniel Magariel's slim book an important one." "Brilliant, urgent, darkly funny, heartbreaking—a tour de force with startling new things to say about class, masculinity, addiction, and family. Daniel Magariel is an exciting new presence in American writing." "Precise and coiled and urgent. Magariel is able--as few writers can--to say so much in so little. A propulsive and intense debut." "Intense, harrowing and brilliantly written... Brutally honest and lyrically compelling... Shows a mastery of control and a labyrinth of nuance... Stunning." "A captivating portrait of a wayward father, brimming with charm and trouble." "A deeply affecting portrait of innocence lost. Like Emma Donoghue’s Room, One of the Boys is impossible to resist as we root for these young men to escape their brutal (yet charismatic) father. We feel the strength of the child through Magariel's precise, understated and unflinching prose, which builds in emotion and suspense by keeping us very close to how each moment leads to the next. A beautiful debut." "Short but haunting... Scenes of paternal neglect under the Southwestern sky call to mind certain chunks of Donna Tartt’s The Goldfinch... A stunning discussion of parent-child loyalty, masculinity, and how the only person we can truly save is ourselves." "A stunning and tragic portrait of both the joys and limitations of love." "Slim and sharp as an ice-pick." "Remarkably lucid and unsparing... Some passages feel so true, you keep wanting to put the book down to applaud... In one of his many crises, the father challenges his sons, 'Tell me one true thing about life... Either of you. Tell me one true thing.'... Magariel has triumphantly, unforgettably, told us."